Renfrewshire Ladies' County Golf Association was founded in 1909 along with Ayrshire, Dumbartonshire, Argyllshire and Lanarkshire and many other counties in Scotland. Dumbartonshire was changed to Dunbartonshire in the 1920's - To read more click on the book below. Ladies born or living in what is defined by the Scottish Golf as Renfrewshire County are eligible for membership of the Association, as are members of Golf Clubs situated in Renfrewshire and affiliated to Scottish Golf. There are 25 Clubs within the County of Renfrewshire. 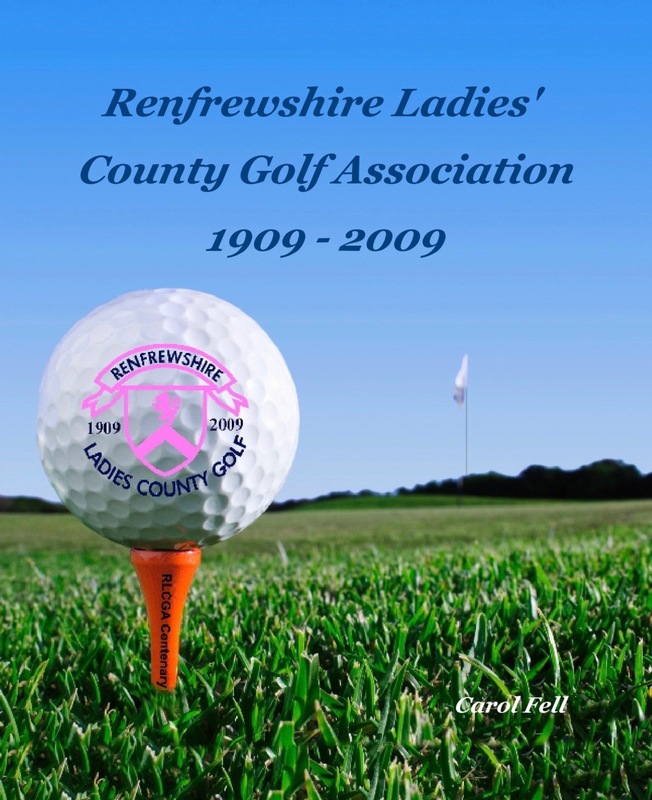 This 200 page book covers the history of the Renfrewshire Ladies' County Golf Association and and their Centenary Celebrations both in Renfrewshire and around Scotland. Everyone that took part in the Centenary Celebrations are included in the book which has over 400 photographs in it. Alas there are no records until 1932. From Paisley, Old Ranfurly and from Renfrew and Whitecraigs. Was Western Gailes – and much enjoyed – well I should think so too! Increasing entries – just arrange a jolly at the coast! Plus Cochrane Castle and Erskine – all joined this happy brood. She'd only served for 30 years – no wonder she was tired! And every time the course was clear to play – she yelled YOOHOO!! So the committee said “ Nae chance!” and opted for Cathcart! Team captain – Mrs Drummond – hoped success was here to stay. When Dorothea Sommerville was picked for Curtis Cup! It wasn't till the 55th hole that the match was won! We obviously had the bestest golfers in the field! Made honorary members of the RLCGA. Is 8 more than the average achieved by you and me! Was that horrid, hated handicapping system straight from hell! With everybody scrambling to avoid that damned point one! Sometimes we're even hard pushed to recall the way it was! And let me tell you Jennifer – you'd better watch your back! But muggins here got lumbered – cos you said you'd be away!!! And organised a web site – who could ask for any more? And well within the time scale that we thought we would require. In order not to bore you all I've covered it quite fast! And others were left out because I couldnae make them rhyme!! And binding us together is our passion for the game..